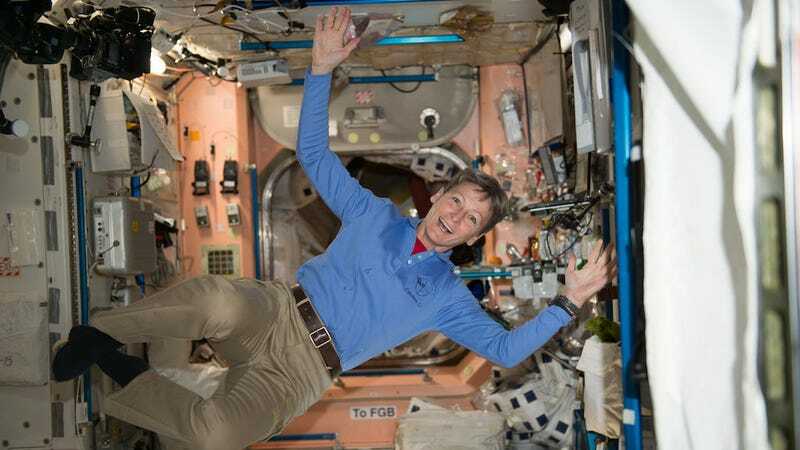 Astronaut Peggy Whitson is no stranger to breaking barriers: In addition to becoming the first woman commander of the International Space Station (ISS), the Iowa native has logged 377 days in space between two missions—the most of any American spacewoman to date. Now, on her third mission aboard the ISS, Whitson is racking up even more impressive feats—today, she performed her eighth spacewalk, setting the record for most spacewalks performed by a woman. The purpose of the spacewalk was to adjust a docking port, which will essentially be a parking spot for SpaceX and Boeing commercial crew capsules, the AP reports. At around 8am EST, Whitson and ISS commander Shane Kimbrough began their preparations, while the rest of the crew just sort of chilled. “You guys be safe and enjoy your time out,” French astronaut Thomas Pesquet said inside the ISS. The previous female record holder for spacewalks, Sunita “Suni” L. Williams, logged 50 hours and 40 minutes in spacewalking time. Whitson’s spacewalk today will last about six and a half hours, not only pushing her past Williams’ record for most time logged, but making her the third most experienced spacewalker of all time, only behind Anatoly Solovyev (68 hours) and former astronaut Mike Lopez-Alegria (67 hours). After today, Whitson will have accumulated 59 hours in spacewalking, but hey, that could grow—she won’t be back on Earth until sometime in the fall. All of us Earthlings couldn’t be prouder of Whitson. Here’s to all the records she has yet to break.